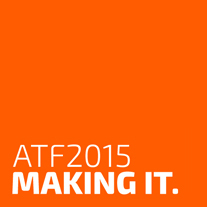 Welcome to ATF 2015: MAKING IT. Held over four days in January, this is a unique opportunity for diverse Australian theatre makers to gather, engage in inspirational conversations, critically reflect upon the state of play for theatre practice, and also examine the histories, legacies and policy innovations that have led us here. ATF 2015: MAKING IT will ask: How are theatre makers ‘making it’ – aesthetically, ethically, culturally, logistically, practically, economically? What are they making? What drives them to do so? Who are they making it with, and for whom are they making it? What new models are enabling theatre artists to ‘make it’? And how might theatre artists continue to ‘make it’ in this current political climate dominated by austerity thinking? In addition to this strong focus on theatre practice, ATF 2015: MAKING IT will also ask: how do we ‘make it’ in the theatre? What are our pathways and our professional journeys? What are our turning points? What are our disasters? What are our strategies for resilience? Finally, a warning. ATF2015 is not an arts market. If you want to buy or sell theatre work, ATF is the wrong place for you. Please don’t come with a pitch to sell your show or sell your event. Instead be prepared to share the passions that drive your practice, and be prepared to listen and be inspired by others as they do the same. You’ll need goodwill, intellectual rigour, openness, generosity and stamina. You’ll also need caffeine, Berocca and comfortable shoes. Driven by strong artistic voices, and embedded within the Sydney Festival program, ATF 2015: MAKING IT will be a truly unique and transformative experience. We will do our best to put the right people in the room, who have something to say, and guide conversations with respect and generosity. The rest is up to you! While there are loads of interesting things in the program, don’t feel pressured to do everything. There will be spaces for smaller group or private chats, or you can hang out in The Right Place, our venue and bar that will quench all manner of thirsts. Feel free to make your own way – just catch up with people and talk about ideas.